Get every last bit from the bottom, rim, and sides of the jar—even the big ones—with this peanut butter knife. The extra-long, stainless steel blade has a curved tip that scrapes jars clean. It’s strong enough to stir and scoop peanut butter, natural nut butters, jams, thick oils and more, and it is extra broad to give you an ample serving with every swipe. Dimensions: 7" x 1" x 1"
This PB knife is so "cool". I like this knife as it is so handy for all kinds of spreads, not only for Peanut Butter. I love the length of this knife and it has worked well and was as advertised. 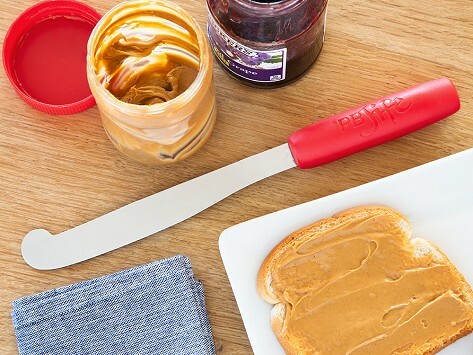 Fed up with sticky knuckles and wasted food, Maker Landon Christensen created this peanut butter knife to help solve a common kitchen problem: getting every last bit of deliciousness out of peanut butter jars. Yes, even the big ones. Landon pulled from his art background along with his PB&J-making prowess as a dad to create the PB-JIFE. The long, stainless steel blade has a curved tip specially designed to reach into all the contours of a jar and scrape the bottom, sides, and rim. But PB-JIFE is not just for when the jar is almost done. The strong, extra-broad blade is sturdy enough to stir peanut butter, natural nut butters, jams, thick oils, and other spreads, too. And it can deliver an ample portion to an eagerly awaiting sandwich with just one swipe. It’s one of the most helpful knives around—jar none.